What is the Mobile Ventilated Cabinet ? 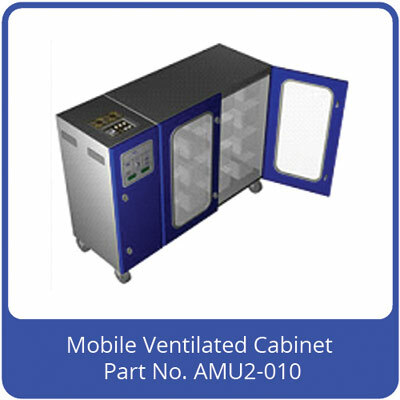 The mobile ventilated cabinet is an enclosure held at negative or positive pressure by a side mounted Midi-AMU. Normally connected to an individually ventilated cage (IVC) rack, the Midi-AMU in this application provides the clean air to a cabinet with open top cages inside. The AMU automatically controls both the cabinet internal pressure and the air change rate. The Mobile Ventilated Cabinet used for under-taking biotechnology experiments. Depending on the nature of the experiment, either product or operator protection may be optimised by running in a positive or negative pressure mode. Positive would for example be used with an SPF (sterile pathogen free) experiment; whist negative pressure would for example be used with pathogenic infected subjects. The Mobile Ventilated Cabinet is useful for small scale experiments where individually ventilated cages are not required. The Midi-AMU has two fans configured in a 100% push-pull arrangement. This allows independent control of cabinet pressure and air change rate and also for the pressure to be controlled at positive or negative relative to the lab. Sensors connected to a cell in the AMU give signals to digital displays on the front control panel showing air change rate and cage pressure. Running is fully automatic and there is a battery standby system in case of mains power failure. The Midi-AMU Mobile Ventilated Cabinet has several advantages over other current systems. The most important one is that the complete system including the fans is low voltage 24 VDC. This means batteries can easily be used for standby running. It also means that the fans system is extremely efficient (about 50W), quiet and with virtually no vibration. Other advantages include automatic running at positive or negative pressures, user selectable air change rates and a room BMS connection. Unlike an IVC, the Mobile Ventilated Cabinet can be configured to take a variety of cage types and sizes. Can be configured to take a variety of cage types and sizes.